There's a lot going on in Levi's life these days. Since starting the Charlotte's Web strain of CBD oil (oil from the marijuana plant that contains only medicinal cannabinoids, not the THC compound that causes a high) he has gained so much strength. We initially began using Charlotte's Web for seizures, and sadly we have not seen much relief in that arena, but he only has a handful of daily seizures now, and so the epilepsy is not causing him much trouble these day, thank God! What we have seen, though, is a huge increase in his cognitive ability, strength of body in areas such as head and trunk control, GI relief, and more. 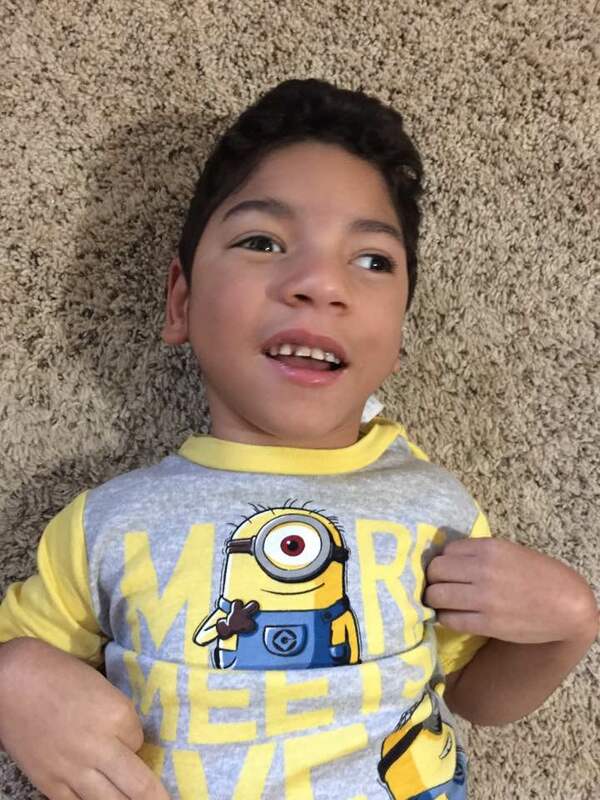 CBD oil has taken a child who was in daily pain and turned him into a happy boy who greets the day with a smile, and ends the day in the same manner. It is truly a Godsend! Charlotte's Web CBD oil is available across the country with no prescription at CWHemp. Levi currently takes .5 ml twice a day of the Everyday Advanced oil. Since it isn't covered by insurance and it's very costly, we will remain at this dose for a while. In the future, however, we hope to see better seizure control with an increase in dosage. Levi hanging out with Dad. Selective Dorsal Rhizotomy is a surgery for those with spastic cerebral palsy, to alleviate the spasticity (extreme tightness) in the muscles. This is an explanation of the procedure, from the St. Louis Children's Hospital website. "At the time of the operation, the neurosurgeon divides each of the dorsal roots into 3-5 rootlets and stimulates each rootlet electrically. By examining electromyographic(EMG) responses from muscles in the lower extremities, the surgical team identifies the rootlets that cause spasticity. The abnormal rootlets are selectively cut, leaving the normal rootlets intact. This reduces messages from the muscle, resulting in a better balance of activities of nerve cells in the spinal cord, and thus reduces spasticity." 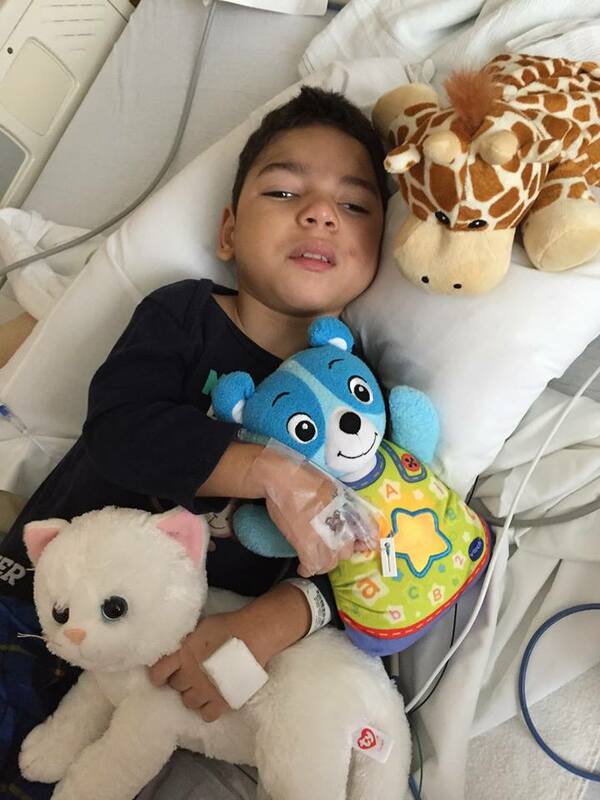 Though Levi always attends Cardinal Glennon Children's Hospital in St. Louis, this procedure is done by a specialist at St. Louis Children's. 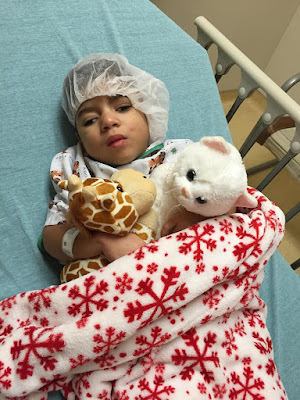 Though it is typically done to help children with CP walk better, Levi is being considered for the surgery even though he is non-mobile, due to the extreme tightness in his leg muscles, and especially the turning in of his feet. He receives Botox treatments in his muscles to loosen them, but the muscle for the feet are so deep they can't be helped with Botox. 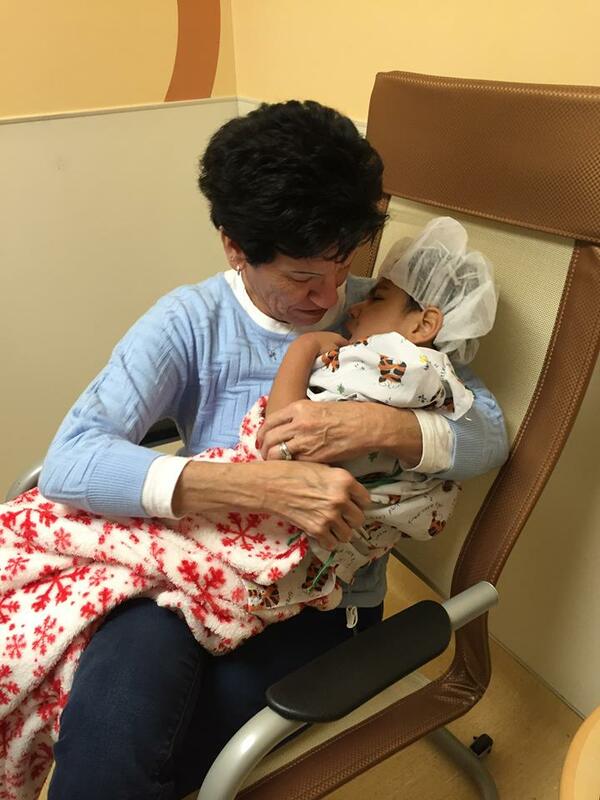 It is our hope and prayer that the dorsal rhizotomy will help. Another huge plus is that the benefits of this procedure last for a very long time. We have the packet almost completely filled out, and will be waiting for word from STL Children's as to whether he is a candidate. 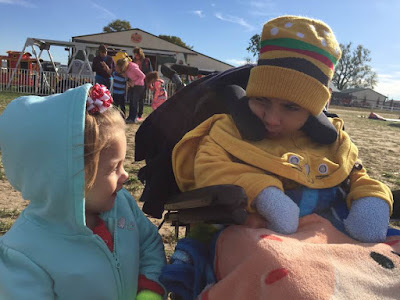 Levi and his sister on a field trip to the Pumpkin Patch. Eye Gaze Technology uses specialized equipment that works with eye tracking. Using something like this, one can make choices, speech, and other vital communication skills using only the gaze of an eye. For someone like Levi, who is non-verbal, but can understand what we say, this makes communication much easier for him. Though he has learned to shake his head for no, the limited ability of his body keeps him quite trapped, unable to tell us what he thinks or wants. 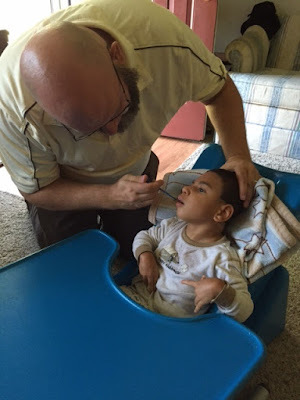 Eye gaze technology has the potential to open up the whole world to him! The process is likely a long one, but we are hoping to do a trial soon to see if this is something that Levi could learn. We all believe he will be very successful at this. His vision teacher mentioned that another student she sees does very well with this technology, and Levi's vision and alertness is more advanced than that child's. We are praying that this will bring him out from the loneliness of his own mind, to be able to communicate his likes and dislikes, wants, and desires to us! 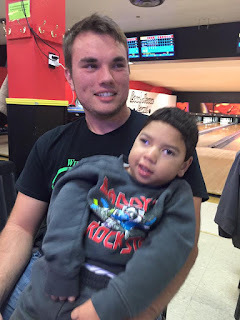 Since the very beginning, when Levi was diagnosed with Group B Strep meningitis at 3 weeks old and spent a month at Cardinal Glennon, I knew I would write about the challenges and blessings we faced during that time. It may have taken me six years to get motivated to write it down, but I've finally pushed aside the procrastinator in me and set to work on Levi's story. Now almost finished, the book will be coming very soon to the Kindle store and paperback. Stay tuned! The second day on CBD oil we have continued to see positive changes in Levi. Most notably, his vision seems much sharper. His eyes are working together and he's focusing well, really studying what he's looking at. He's more interested visually, and follows his little brother and sister as they run around the room. He's been so happy, kicking his legs and laughing. Moga (my mom) was here yesterday, and he said her name! This is not the first time he's done so, but it's been a long while since it's happened. Usually when he gets that excited, it ends with a seizure, but not today! Patrick made an amazing discovery last night. Though we paid for the highest strength of Charlotte's Web, and the box we received was correct, the actual product inside was the company's mid-strength hemp oil. 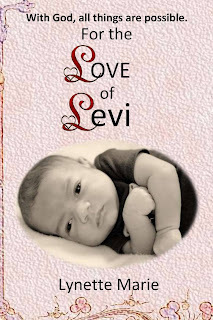 So, Levi has actually been getting half the dose we thought he was. So, we increased the dose this morning, and I'll be calling CW Hemp soon to rectify the situation. Stay tuned to Levi's journey with cannabis oil. 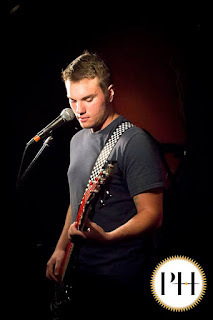 Wonderful things are in his future! 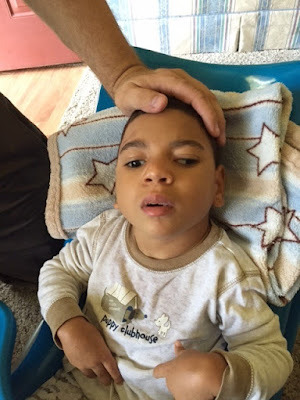 I think these pics show what may have been one of Levi's first seizures. He was four days old here, and I thought it was funny how he kept stretching out. In retrospect, it might have been the first sign that something was wrong. Charlotte's Web was delivered yesterday evening around 6:00. The wait has seemed interminably long since I placed the order on Friday. Levi received his first dose of CBD oil at 6:30 with his dinner. The cannabis oil is first and foremost to help, and hopefully eradicate, the daily seizures that Levi has due to having Group B Strep meningitis shortly after birth. 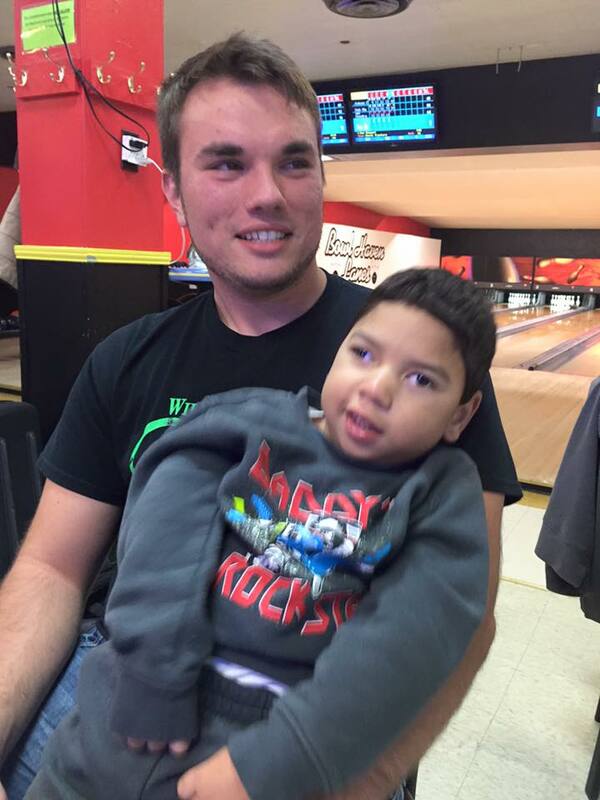 He also has hydrocephalus with a VP shunt, cerebral palsy, developmental delay, and more. The day before, I counted seizures to see if my estimate of 5-10 a day, recently going up to 20 a day, was accurate. It was. Levi remained within the 10-20 range the past two days. Yesterday was not a great day for Levi. He was stiff, having gas pains, and uncomfortable. That ferocious frown was on his sweet little face from time to time. He stayed in his feeding seat most of the day, as he was not comfy in bed at all. Following the 6:30 dose of marijuana oil, we noticed a difference within half an hour, starting as early at 10-15 minutes after the oil was given. First, his eyes brightened and he was more awake and alert. He has alternating exotropia, which means his eyes can roll to either side. It basically looks like two lazy eyes. 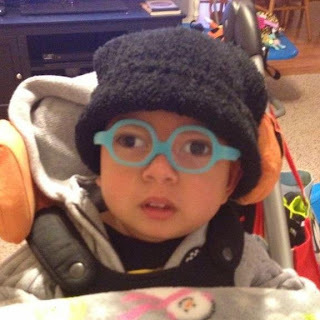 Levi also has cortical visual impairment, a neurological condition that has greatly improved since he was a baby. At first, he was legally blind, but with vision therapy he can see and even track. He wears glasses for farsightedness. His eyes can work together, but lately, even his glasses haven't helped a great deal, and he works hard to get them off his face. As you can see in this pic taken directly after CW Oil, Levi's eyes are not straight. After Charlotte's Web, his eyes almost equalized, and he was focusing on objects. I put his glasses on and, for the first time in many months, I saw an improvement with them. He was interested in everything, looking all around, landing and focusing on different objects. This morning, he had has second dose of Charlotte's Web hemp oil at 6:30 a.m. 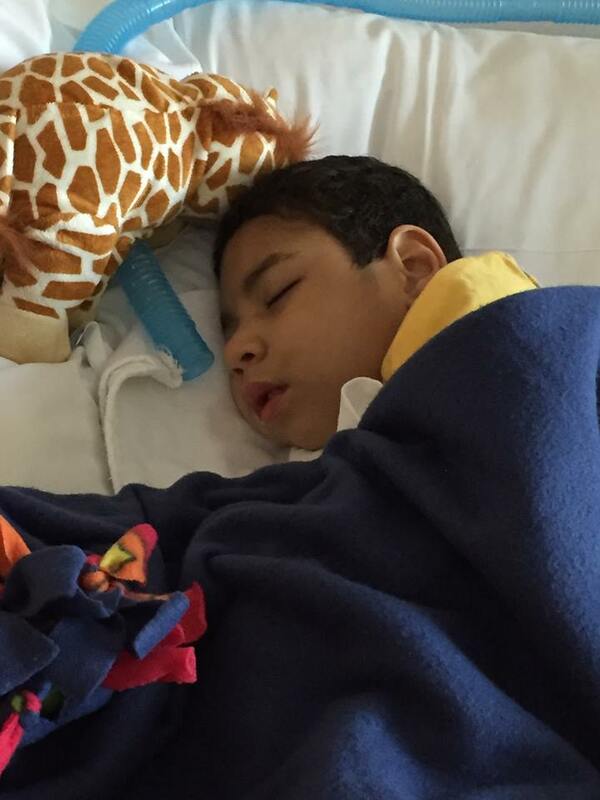 He was awake, alert, and stiff with gas before the dose. In the first 20-30 minutes he was restless, had a few seizures, and moved around as if he couldn't get comfy. Then all at once, he calmed down, his eyes focused, his body relaxed, and his noisy breathing quietened. He fell into a restful sleep. One thing I want to stress to parents who are looking for Charlotte's Web for their children is that, as long as the state where you live has legalized medical marijuana, and probably specifically CBD oil, you can simply hop online and buy the product from CW Hemp. You DO NOT need a prescription. However, insurance will not pay for it this way, and it is expensive. But if it can help your child lead a happier, healthier life, it's worth it! Charlotte's Web Cannabis oil, which has helped countless children with intractable (not controlled with medicine) epilepsy, is due to be delivered tomorrow. Our neurologist said sometimes results are misleading because parents are so excited to try it, they report better seizure control with CBD oil than may be true. So I thought I would document exactly what's been going on with Levi before we start Charlotte's Web. As I told the doctor, the ketogenic diet was the only thing that worked at all in regards to seizure control for Levi. Traditional medicine either made the seizures worse, or had such a sedating effect that he slept all the time. 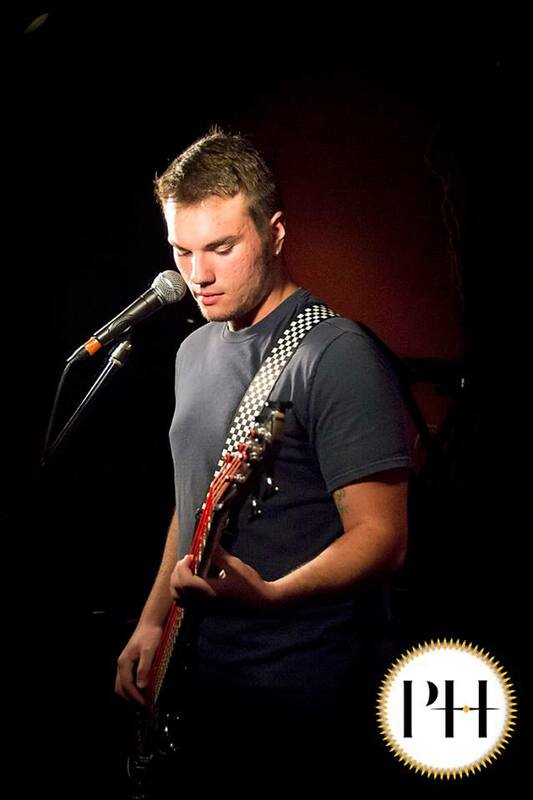 The ketogenic diet took his seizures from 200-300 a day, down to a handful a day, over the course of three years. 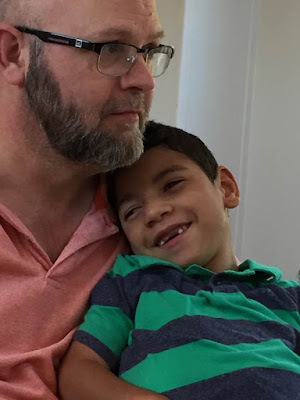 Though the high fat: low carb/protein diet was hard on Levi's system, it was a miracle for Levi, and I would suggest it to anyone dealing with intractable epilepsy. I estimate that Levi was having 5-10 seizures on a normal day, and the past few weeks, that amount has gone up to around 20. He's had a fever, so that may have something to do with the increase. As today is hopefully the day before he starts Charlotte's Web, I decided to count seizures and get an accurate picture. Of course, every day is different, and this will be just a snapshot of one day, but at least it will give us a good idea of his true seizure activity. He's been awake for three hours, and has already had 5 seizures, one of which was very hard, and he fell asleep after it was over. These are rare for him, but apparently, they still happen. The others are his normal 3-5 second jumps, jerks, etc. Before the seizure, he was awake, alert, and happy. Now, even though he slept for a little while, he is tired and his breathing is a bit labored. We are looking forward to the delivery of the cannabis oil tomorrow, and plan to start it immediately upon arrival. Please pray for Levi. I can't believe I'm actually writing this right now. For the past few years, ever since I heard of the amazing benefits of the strain of Cannabis oil called Charlotte's Web, I've looked forward to the day when Levi could try it. NOTE: This marijuana oil does NOT cause one to get high. There's no psychotropic effect at all. For those of you who don't know, Charlotte's Web is named after Charlotte Figi, the first epileptic patient that was helped with this oil. She was five-years-old, and had lost the ability to walk, talk, eat, and more, when she began this medication. She was having 300 grand mal seizures a week. After the first dose of CBD oil, she was seizure free for a week. Now, she only has a seizure once in a great while, typically while she's sleeping. Charlotte has regained all these abilities and is a normal little girl again. We saw our neurologist today, and he agreed that Levi is an excellent candidate for CBD oil. Illinois does not have a dispensary that produces this strain of marijuana oil, so we have to order the hemp oil from Colorado. This is wonderful because we can start it right away, but we can't go through insurance until Illinois produces the strain. I'll receive it sometime next week!!! 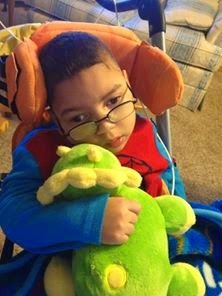 Although we know that, just like any drug, it works differently for every person, we are praying that it will take away his seizures for good. I plan to update frequently once we start Charlotte's Web, Please pray that we see amazing results. This has the potential to help Levi with every issues he has, from seizures to cerebral palsy pain to vomiting and nausea, and even more! Last Wednesday (it is now Monday) Levi was admitted to the hospital with breathing problems, congestion, sleeping almost nonstop for three days, and fever. Of course, these are all symptoms of a shunt malfunction or infection. (The shunt drains excess liquid from his brain and empties into his stomach). Thankfully, the shunt is in great working order. Levi has a nasty adenovirus. This past week has been rife with ups and downs. He will get better just to get worse again. Finally, I think, we have turned the corner for the better. Last night, Levi's breathing was much worse, coughing with just about every breath, so much congestion his nose and mouth were being suctioned very often, and he was just all around miserable. The doctors ordered albuterol breathing treatments, which he'd been getting as needed, scheduled every four hours, with treatments in between if needed, and an airway clearance vest that literally shakes the mucus loose from the chest. He loves it! All morning and the greater part of the early afternoon he sounded horrible. Even the respiratory treatments were not helping for long. Once the treatments started coming closer together, and we cuddled together for a long time, Levi was able to relax. His breathing settled, and he was able to sleep well. Here's hoping that the worst is over and good days are on the way! Orthopedic Surgery, Eating REAL Food! A couple weeks ago Levi had surgery to lengthen his Achilles tendon so his feet would no longer point downward. Both legs are casted up to the thighs, with his feet in a flat, slightly out-turned position, to correct the inward turn of the ankles. He's done very well after the surgery. Oddly enough, this week seems to be the worst, I'm not sure if his legs itch or if he's fighting the casts and trying to move his legs. At any rate, the casts come off in a few days. At that time, Levi will be molded for new braces, and will receive short casts until the braces are made, which should be a week or so. 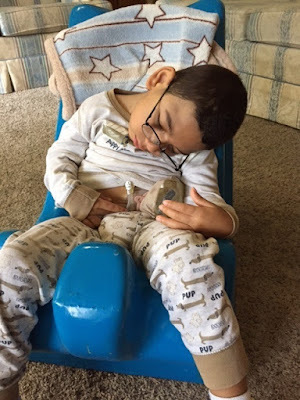 All in all, it hasn't been overly difficult, and should make a tremendous difference for Levi as far as comfort, as well as learning to stand and walk. It's an exciting time! He's also been sick recently. He's had an ear infection for the last few weeks, the antibiotics don't seem to help much, so he received an antibiotic shot and a referral to ENT to have tubes put in his ears. Most exciting, we decided to put Levi on a real food, or blenderized, diet. He still eats the majority of food through his feeding tube, but we are no longer using formulas for all his nutrition. In fact, he just receives a few ounces overnight of Compleat Pediatric, a formula that is made with real food ingredients. Throughout the day, he gets a combination of baby foods and regular food blended to a thin consistency. Since we started this about six weeks ago, Levi has not thrown up once! Thanks for your continued prayers for our sweet Levi! Orthopedic Visit, More Exciting Firsts, and Good News! Levi had an appointment with the orthopedic doctor today. His feet have been turning inward and pointing down for quite a while, and it's grown progressively worse. He takes daily medication for tight muscles, and gets Botox injections a couple times a year to keep them from tightening so much that it causes him pain. The doctor said the tightness in his feet is caused by more than tight muscles. His Achilles tendon is too short. Next month he will have surgery to lengthen the tendon so his feet will be able to stand flat. He will have short casts on both legs for about four weeks, and after that he'll have special braces. Though we are never excited for another surgery, this should make a huge difference for Levi in comfort as well as productivity. Stay tuned for more great things! As we have always said, God is doing wondrous things for Levi. It feels wonderful to see him so happy!